Michael Dell: "We are disappointed with the company's results, but what matters is our future plan of action"
Dell chose the release of its Q4 financials as an opportunity to boast of its increased international shipments and improved customer service. And no wonder. Dell 's revenue was $14.4bn - reduced from $15.2bn in the same period during the last financial year. The problems are mounting for the Texas-based PC manufacturer as it falls further behind the current market leader, HP . "We are disappointed with the company's results, but what matters is our future plan of action. 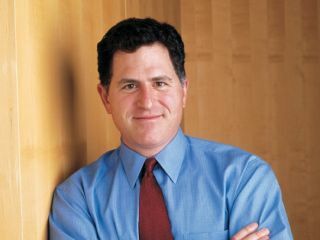 We are systematically moving to...transform the company," said chairman and CEO Michael Dell in a statement. "Our business model will become more aligned with the needs of our customers, which will improve their experience and yield improved growth and profitability for the long-term." The financial statement makes fairly grim reading and includes an announcement that employees will not receive their full bonuses for missing key targets. Dell also said it was hoping to shorten product development cycles and "make decisions closer to the customer" by providing more localised services. Dell wants to become even more global in its outlook. "We won't achieve our goals overnight, but we will achieve our goals," continued Michael Dell. "We will be known again for strong operating and financial performance and a great experience for our customers. But it will take time to realise the future benefits of the improvements we are making today." Dell also attributed some of the reduced revenue to "ongoing investigations into certain accounting and financial reporting matters". Dell executives have been accused of inflating the price of shares from 2003, before selling them for more than $3.3bn in 2004. The accusations are wrapped up with the alleged payments made by Intel to Dell to use only its processors. Dell now also offers AMD chips in its machines.